The M1210 isn't helped by retro styling. Dell has spent two years building its XPS line of laptops up as the cutting-edge of gaming for the mobile generation. However, with the recent acquisition of Alienware, there has been a perceptible shift in the XPS focus, with the machines being targeted more as high-end multimedia machines. To this end, the Dell Inspiron XPS M1210 (£1189 inc. VAT) doesn't come with state-of- the-art graphics, but instead packs the nVidia GeForce Go 7400 into its compact and small 2.1kg chassis. This graphics are a mainstream option, as befits its 3DMark 2003 score of 4445, which is better suited to multimedia than the latest games. The styling of the laptop is rather retro, with a compact and squat look to it. However, the build quality is solid with a reassuring feel about it. With a thickness of 41mm, its deeper than the average ultraportable, but it needs this space to deal with the GPU and similar components. This isn't a cool running machine, as we found it quickly grew warm on the left-hand side of the casing. Powered by an Intel Core Duo T2400 chip, which runs at 1.83GHz, and supported by 1024MB of DDR2 memory, there is plenty to recommend here. 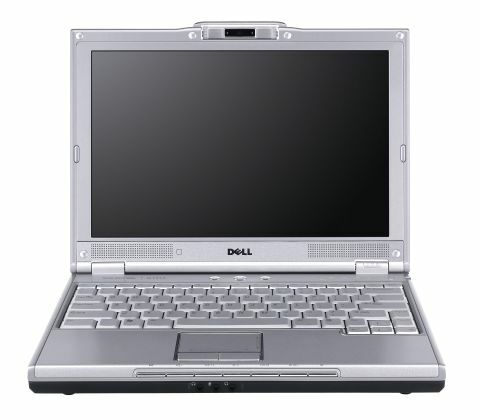 With a MobileMark 2005 score of 238, we found this a quick and responsive laptop. As befits the smaller chassis size, you'll find a 12.1-inch Super-TFT panel. This is a widescreen display with a 1280 x 800-pixel resolution, so images are crisp and sharp without being too small. A 1.3-megapixel webcam sits above the panel and can be rotated 180-degrees. We were surprised to find a DVD rewriter built into the machine. Even more surprising is the inclusion of a built-in 3G module. While our review unit didn't come preloaded with a SIM card, this can be specified at time of purchase. The keyboard is well spaced and the keys proved comfortable to use, with a fair degree of travel. The touchpad is small and deeply recessed. Fortunately, the mouse buttons are flush with the case, which makes them easier to access. In terms of battery life, the use of such highly specified components was highlighted by a less than ideal test run. The system lasted for 166 minutes, under test, using the standard battery pack. However, a second extended battery is included in the price, which produced a battery life of 269 minutes. Don't come to the Dell Inspiron XPS M1210 expecting an ultraportable gaming solution. True, it will play most mainstream games with ease, but this laptop is better suited to multimedia. This may not be the mini-gaming marvel we were expecting, but we were impressed with what it had to offer.